One of the most frequently asked questions by those who come into our bike rental shop in Scottsdale is: “What are the best cycling routes near the AOA bike rental shop?” On this page you will find three of the best road bike routes that are within a short drive of, or beginning at, our bike rental shop in North Scottsdale. If you’re looking to rent a bike in between business meetings or conference events, the 13 mile AOA Shop Loop may be the perfect ride for you. This short ride makes you work hard at the beginning, but after two short climbs, it’s all downhill from there. Enjoy wide bikes lanes, smooth pavement and mountain views for the whole route. Need more miles before heading back to your next meeting? With this route you can easily add some distance. 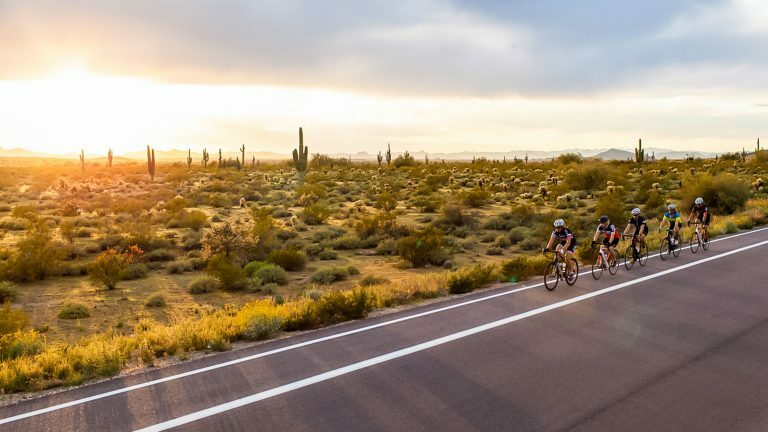 This pleasant road bike ride winds through Paradise Valley with an “official” start and end point at the Sanctuary Hotel, which is nestled into the north side of iconic Camelback Mountain, but it can also be easily accessed from a variety of local resorts or modified to begin at AOA’s bike rental shop. This intermediate ride combines gentle and flat, taking you in and around the outskirts of Paradise Valley and through the neighborhoods of Arcadia and Scottsdale, made up of beautiful old brick homes, lush estates and quiet streets. After a few short, punchy climbs (check out our blog on Phoenix climbs) on the slopes of Camelback Mountain you’ll head back around to finish at the Sanctuary Hotel. This long, out-and-back scenic ride will give you amazing 360-degree untouched desert views with every turn. From the AOA office, you will begin with a moderate climb and continue to gain elevation as you zigzag northwest to the Phoenix Sonoran Desert Preserve and onto Sonoran Desert Drive, a nice long scenic road designed to make the most of the surrounding scenery. There are no traffic lights on this long section of road which makes for about 14 out and back miles of steady effort. If you’re looking to ride the smooth, wide roads of Scottsdale, AOA will have a bike tuned and ready for you to ride. Choose your route, your rental and start pedaling!